The thrill of 4x4 Off Road Driving cannot be rivalled for sheer excitement and white knuckled tension. This is your chance to spend 3 hours as part of a team of up to 4 drivers with a qualified instructor. Certificate for all attendees. This experience will last a total of approx. 3 hours with approx. 3 hours in the vehicle. Suitable for anyone wishing for experience and knowledge of the basic factors of driving 4x4 vehicles in an off road environment. * Crossing ruts, ditches and mounds. You will be one of a team of up to 4 drivers that we arrange, sharing a modern vehicle and accompanied by a qualified instructor for a 3 hour session. Sessions run 9:30-12:30 on selected days throughout the year. All Drivers must hold a full UK driving licence. 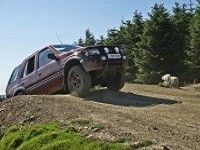 The voucher will have Swansea Valley (offroad) printed on it, but it can be used from..